APPEARANCE: Bright, slightly hazy orange color with burnished bronze edges. Beautiful coloring. HEAD: Bright white, fluffy and full. Faded appropriately. NOSE: It’s not a nose-burner, but this is as lovely an aroma as you’ll find in an Imperial IPA. A gentle background of pale malt provides the foundation for a vast array of citrus fruit notes from the giant hop profile. Grapefruit, lemon, tangerine, pineapple, and a faint hint of spruce. Begs to be tasted. TASTE: The taste does justice to the wondrous nose. Those citrus notes take center stage with the bitterly refreshing grapefruit and fruity pineapple being the most obvious flavors. Enough sweet, pale malt in the middle to allow the center to hold and a drying, cleanly bitter finish just makes you thirsty for another swig. The bomber did not last long. MOUTHFEEL: Fuller than medium-bodied but drinks incredibly smooth. Nice effervescence keeps it light on the tongue. DRINKABILITY: Good lord is this beer drinkable. It’s tops on Doc’s personal Imperial IPA list for a reason. I’ll admit I wasn’t blown away the first time I had it, but I also hadn’t developed a taste for Imperial IPAs back then. Now that I’ve learned to stop worrying and love the hop-bomb, I can fully appreciate the brilliant brew that Lagunitas has provided us with. Absolutely one of the best Imperials on the market and a “must-drink” for any hops-lover. 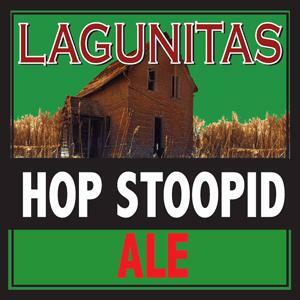 Posted in Tasting Notes.Tagged Alys Beach, Hop Stoopid, Imperial IPA, Lagunitas, Slouch Sixpack. Not my favorite, but a damn good offering from my favorite style. Very, very high drinkability however. I would say that it is the most drinkable of the double IPAs. The only other I can think of with same level of drinkability is the Hale’s supergoose.